The tropics offers a plentitude of medicinal plants to keep health for ourselves and our domestic livestock. The processing of them allows people to gain access to health giving products and generates income. 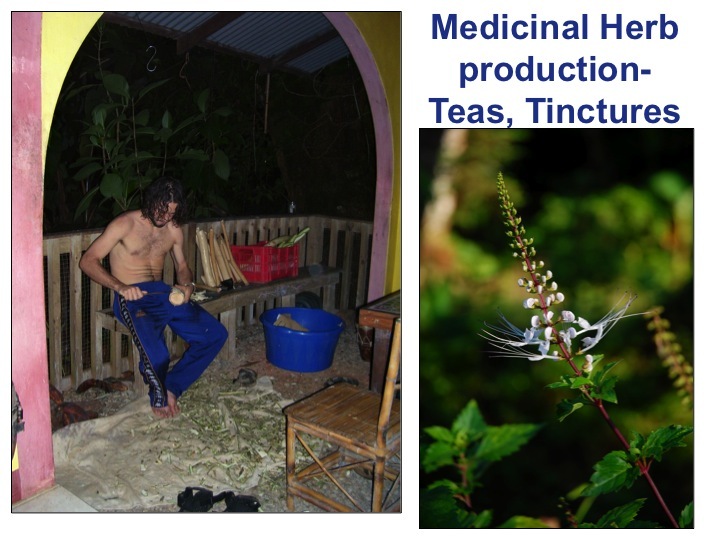 In the picture above on the left, the author can be seen processing the powerful medicinal herb that i s commonly sold in health food shops globally called Pau D’arco. This Amazonian herb was planted widely at the farm that I worked on in Costa Rica for nine months in 2005-06. It is processed similarly as another on farm medicinal that we had known as cinnamon. The Pau D’arco is harvested through cutting branches which does not harm the tree as it coppices if not over harvested. The bark is then peeled and the cambium layer is cut off and then dried. From there it is made into a dried tea or soaked in strong alcohol to make a dark and rich tincture. Both help with the immune system and are said to be good for helping with gut health as well. 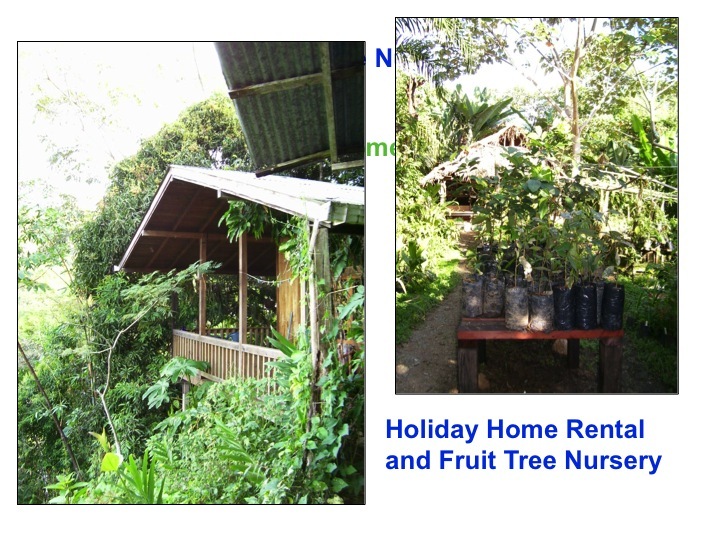 The second picture shows a plant from the mint family that was grown abundantly in Malaysia where i worked in 2009. The project that i was working with was affiliated with an AIDS encampment dealing lots with Burmese refugees. They grew this plant as part of the garden therapy for the patients at their on ground gardens. It is said to be good for blood sugar levels and is processed similarly to any other mint family: dried and tea. It is a beautiful plant that produces abundantly from being cut and tended to appropriately. Also in Malaysia, this time on the island of Penang, I say a unique way that one farmer was creating an alternative to a common medicinal input for chinese cooking: swiflets birds nest. I add this slide in because locally you will find unique opportunities. 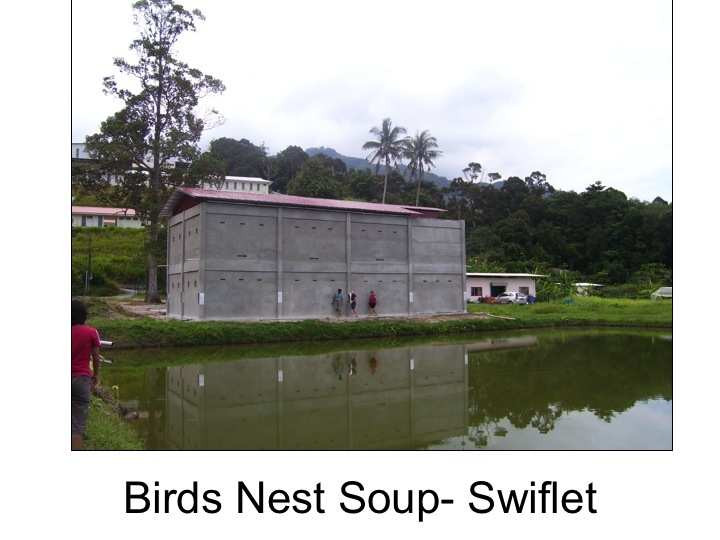 While the building was made out of unsustainable concrete blocks, it does provide an alternative to the wild nests and the extractive processes that can be damaging to the birds natural habitat. Also in Costa Rica, one of our main on farm products was the processing of plant material using steam to extract essential oils. When shopping for these plant products at shops or receiving a massage, plants had to be grown and processed to make this product. They come from different parts of the world and some of course are tropical. The ones that we grew were cinnamon leaf and bark, lemongrass, citronella, and the amazing scent of Ylang Ylang. This last one is extracted from the delectable flowers and required two days of picking from coppicing the fast growing tree. 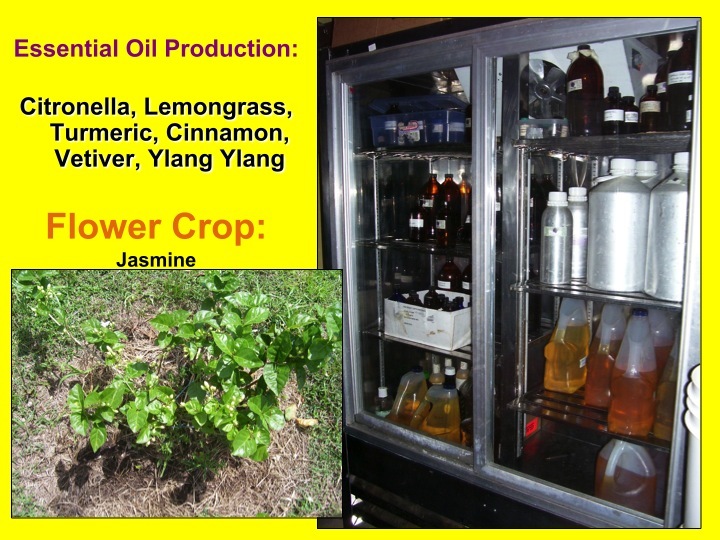 To produce this, and other essential oils, it does require huge amounts of plant material. This is what translate to the price of each oil as well of course as common economic factors of supply and demand. In our operation, we used steam to extract the oils and had a lab for bulk storage, bottling, labeling, and distribution. Another local influence in Malaysia, was the production of Jasmine flowers as part of Hindi prayer. The plants are normally grown intensively with chemicals but simple system integration allows them to be grown organically. The flowers are picked often during their flushes and are processed into chains and sold. Other cut flowers at markets can be great options for generating revenue depending on your market. The production of bamboo as a fiber, building material or food product can be a great cottage industry as well. Its rapid growth is astonishing in the tropics especially the bigger timber types. The above picture shows a colleague in a major reforestation project himself and Evan Marks designed for the Firestone Tire Foundation. Bamboo was used extensively there for stabilizing the denuded landscape and was integral in the swale and dam building landscape that allowed the spiral of erosion to be altered. 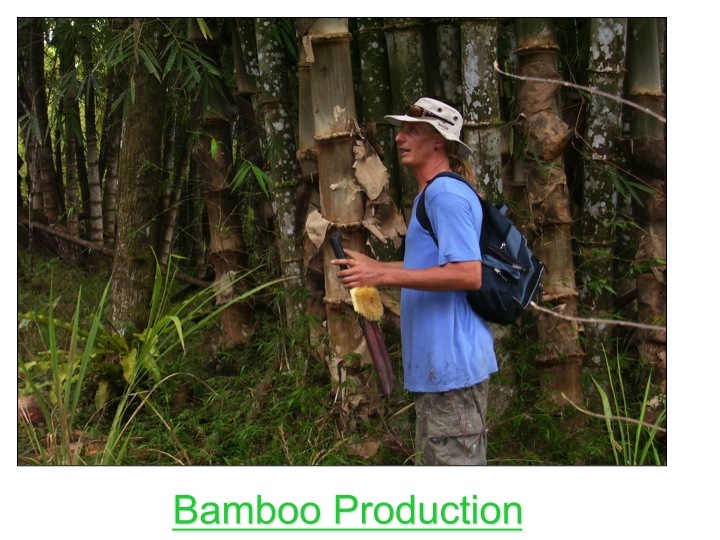 Bamboo is a resource that actually needs interaction of harvesting to continue to thrive and be a renewable resource. Bamboo needs proper processing to be a truly useable resource for building and this ancient techniques are once again spreading. As the growing of crops traditionally and societal structures that encouraged cooperation were broken by colonialism and evolutionary pressures, the passing of environmental literacy from generation to generation was lost. Thus we need to reinstate holistic education and permaculture offers one form of education to enable the repair of how view the material world. 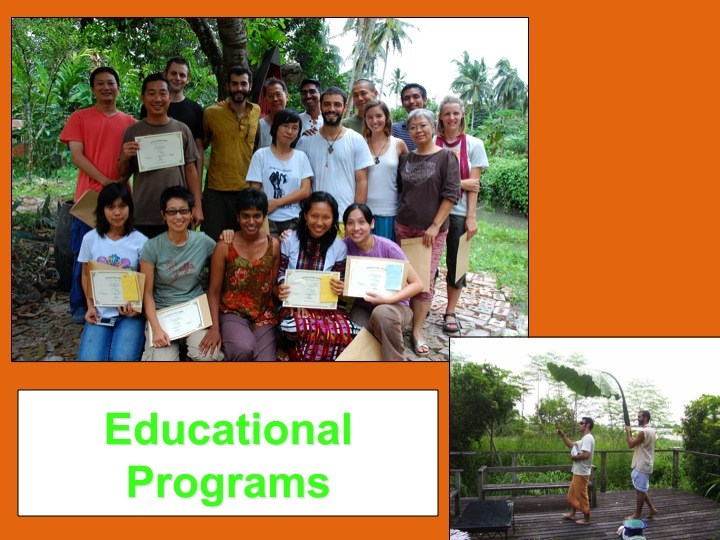 Thus permaculture courses offer a economic infusion into the project and can have lasting positive affects in your community. In the graduation picture above, the first PDC ever in Malaysia that we taught in 2009, was an affordable course for locals which allowed the movement to kick start there. Some courses in the tropics are destination courses where outsiders who are destined to travel spend part of their travels doing a PDC or other courses. This is justifiable as well because either there, or in other locations, these people hopefully begin to practice permaculture as well. Along their travels they spread the word of permaculture and our workings with locals during our stay often helps improve their farming methods and community relations. I have taught a couple fo destination courses in teh tropics and i know my interaction with locals has been a great give and take relationship of knowledge and skills. 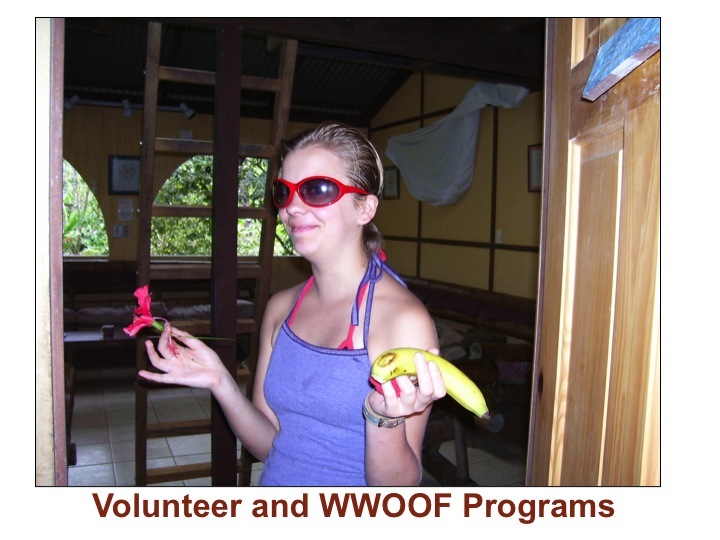 Along this thread volunteer and wwoof programs develop so that travelers have options of giving back while on holiday. This model helps to offset farm costs and gives people a chance to practice skills learned in a pdc or pick up on organic gardening and holistic farm management. Some places offer this work exchange while others charge a small daily fee to cover costs of food and some operating costs like employing managers who will be directly leading people who have a will to learn. Some farms offer small stipends to those who stay long term and already have a skill base to build off of. All are valid models as permaculture systems require creative interaction from humans and are less machine driven. To gain practical skills we must engage and learn from others and these offer one way of doing so. Another common income infuser into projects is holiday home rental. An extra building or two onsite can be reserved for tourists who also seek a certain level of interaction in Permaculture settings. Tours can be offered to them directly as well as processed products like teas and essential oils to further develop those markets.